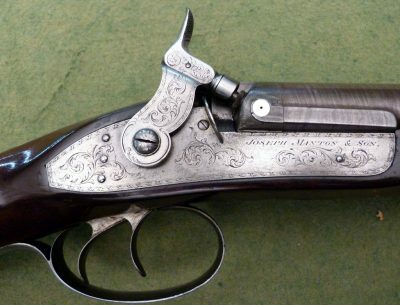 With 32 inch sighted browned two stage barrels reinforced for 10 inches at the breech, signed on the top rib “JOSEPH MANTON & SON. 6, HOLLES STREET, CAVENDISH SQUARE, LONDON” and stamped underneath T.E. for the barrel maker Thomas Evans, finely engraved tang, signed locks with floral and border engraving ensuite with the solid hammers with detachable strikers, smooth figured walnut stock, vacant gold escutcheon at the wrist, finely engraved iron mounts, bone tipped ramrod with worm; in a leather case lined with green baize and with accessories including powder and shot flasks, loading/cleaning rod etc., the inside of lid with facsimile maker’s trade label for circa 1834-1838. London Proof marks.